There was a lot of snickering Thursday after Groupon announced an IPO valuing it at $30 billion. But the company might actually be worth a lot more than people think. It didn’t take long after Groupon filed for an IPO Thursday that valued the company at $20 billion for the snark to start flying around the web. “$GRPN ‘s S1 can be boiled down to: ‘we don’t really have a biz model, we’ll try some stuff & will lose money for yrs’ ..can ya’ spare $750M?” said one tweeter. “Can’t wait for the $LNKD/$GRPN merger: one email offering a half-price dinner at a place I don’t like w/ someone I don’t want to see,” said another. We get it. On the surface, Groupon looks like a dodgy proposition. Sure, it’s had phenomenal growth (from 152,000 subscribers and 212 merchants in June 2009, to 83 million subscribers and almost 57,000 merchants worldwide in March of this year). But important questions persist about its underlying fundamentals. All of which leads to the question: Is Groupon the next Webvan, madly overvalued and ultimately unsustainable? Or is it the next Google, underestimated by some (at the time of its IPO), but nevertheless poised to completely transform an industry? Webvan was the delivery company back in the go-go years of the early Internet that allowed you to order groceries online and have them delivered in a precise half-hour window. Customers loved the idea, but the model was ultimately unsustainable. Webvan poured huge amounts of money into infrastructure, but eventually went bankrupt. 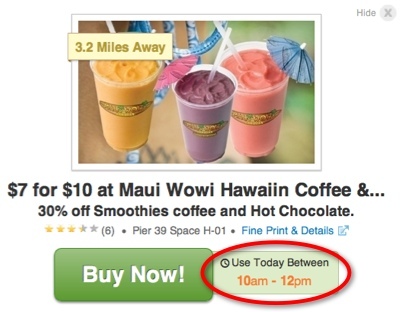 Those skeptical of Groupon’s future prospects sense the same shakiness in the coupon seller’s model. Despite its amazing growth, it’s still not profitable. It brought in $713 million in revenue last year, but still lost $413 million, according to the company’s S-1 filing. Add to that the skepticism that Groupon’s model can survive. Much of the company’s growth last year was due to its massive expansion into new markets. But it’s not clear how many merchants trying Groupon for the first time become repeat customers. The S-1 filing says there’s so much demand on the merchant side that in some markets, the waiting list to get vetted is nine months long. But it doesn’t talk about how many of those merchants come back. And meanwhile, horror stories persist about merchants who give the service a shot, have terrible experiences, and vow never to go near the service again. All of which begs the question that’s been rattling around for months: Does Groupon have legs? Will it be able to survive once the novelty wears off? Will it be able to craft a sustainable business? If you look at Groupon based on what it is today, the answer probably is No. The customer acquisition costs involved in a model based on deep discounts is too high for many local merchants, and the targetting too imprecise. In the long run then, this theory says, Groupon won’t become a viable marketing channel for local merchants, and its core business will dry up. The worldwide market for local advertising is huge–in the hundreds of billions of dollars. Anyone who can figure out how to grab a meaningful slice of that pie stands to make a pretty penny. You’re not going to get very far, of course, if the only advertising product you can offer are deeply discounted coupons spread about helter skelter. But what if your advertising products could help merchants solve the conundrum they struggle with every day: how to move specific inventory, to specific customers, at specific times? Now, that might actually be worth something. Here’s a very simple example. Imagine you own a bakery. Maybe you have lots of foot traffic in the morning, as people pick up their coffee and muffins. And maybe also on the weekends, when there’s big demand for your tarts and baguettes. But how about on weekday afternoons, from about 2 p.m. to 5 p.m.? It’s probably pretty dead. The hourly revenue plummets, but the fixed cost remains the same. What you’d really like, then, is a way to move inventory during those specific hours. As it turns out, Groupon may be able to help. Lost in all the frenzy over the IPO announcement Thursday was a small sliver of news about a new Groupon service: Groupon Now. Merchants can now dispatch offers that are available right now, for a limited time (like the one at right). Meanwhile, Groupon users in this new world have set up alerts to let them know when there’s a good deal going on right now, in their general vincinity. So now you have 20 people who grab that Groupon and march over to your bakery for an afternoon pick-me-up. Your bakery moves the cookies, sells a bunch of extra drinks that it wouldn’t have sold otherwise, and maybe moves a few tarts and baguettes as well. A downtime that would have seen excess inventory go to waste now sees bustling business. So what if Groupon created a whole suite of products that served this purpose? You’d have a system that could help clothing stores move blouses that weren’t selling, theaters sell last-minute seats to shows that hadn’t yet sold out, arts-and-crafts stores to target stay-at-home moms during slow weekday morning hours. Carry all of this to its logical conclusion, and here’s what you have: An advertising system that enables merchants to move the inventory they want to move, to the customers they want to move it to, at the time they want to move it. What does that look like? A new, powerful variation on AdWords. Groupon’s IPO contains clues–albeit opaque ones–that this might be where it’s headed. “We use our technology and scale to target relevant deals based on individual subscriber preferences,” the S-1 reads. “As we increase the volume of transactions through our marketplace, we increase the amount of data that we have about deal performance and customer interests. The S-1 also talks about the huge effort Groupon is making in acquiring subscribers. It spent $263 million last year on marketing. That’s a big chunk of change, but it also dovetails with a strategy geared toward helping merchants find the exact types of customers they’re looking for. The larger pool of customers to draw from, the more likely any particular merchant is going to be able to find the subset they’re looking for. Still feeling skeptical? Then consider this: A couple of months ago, Groupon nabbed for its new COO Google’s former vice president of sales operations, a woman named Margo Georgiadis, who, as it turns out, was responsible for driving not only sales operations across various regions and channels but who was also responsible for the technology teams that commercialized AdWords, AdSense, and display advertisements to advertisers and publishers. At the same time, the company doesn’t seem to be standing still. It’s talking to its customers (the merchants), learning what they need, and trying to design products that help them. If it does indeed create ways that deliver meaningful results for merchants–and can do that in a financially sustainable way–then it does indeed stand a chance of–if not actually assuming Google’s mantle–at least being as good a bet as the search giant was when it IPO’d back in 2004. Attitude is not everything, but it’s also not nothing. And Mason demonstrated a Google-like attitude in a letter he wrote to investors as part of S-1. “We are unusual and we like it that way,” the Mork of social startups writes. “[W]e vowed to make Groupon a service that people love using… nothing [will] be as crucial to our long-term success as happy customers and merchants,” Mason continues. It’s not quite “Don’t be evil” and “we do not plan to give earnings guidance in the traditional sense,” as Google founders Larry Page and Sergei Brin wrote in their letter to investors back in 2004. But it’s not too far off either.